A new investment in Accra was our slow cooker. Nothing fancy, but it is perfect for hot days (which is most of the year). We like to cook from scratch, and have made ragu for polenta, chickpea curry, lots of soup, Moroccan stews…. On Sundays I usually make yoghurt for the next week, and some sort of slow cooker dish so lunch is sorted for the next few days. We like to cook from scratch, and have made ragu for polenta, chickpea curry, lots of soup, Moroccan stews…. This time, the sweet potatoes looked good, we had fresh ginger, so soup it was. Sunday morning: soak the lentils in a cup of water, and go back to bed to listen to the Kermode/Mayo film podcast on BBC. Yes, these split yellow lentils should not need soaking, but these lentils do — possibly old? Yours might not. Later that morning: In a frying pan, heat the oil and gently cook the onion, cumin, coriander, lemongrass and ginger, until the onion is softened. Peel the sweet potato – I had one very large one. Ask your husband to chop the sweet potato, which he does without complaint. This is the white-fleshed kind. I have a slow cooker, which I love, so I tossed it all in there: sweet potatoes, stock, onions and spices, and slightly soaked lentils. Cook on high for 4 hours or so, until the lentils and sweet potato have softened.. If you do not have a slow cooker, this can easily be done on the stovetop in a covered pot (maybe 45 minutes or so?) Take out a cup or so of cubed sweet potato and keep it aside for texture. With an immersion blender, purée the soup until smooth. At this stage, I added salt and decided to add some coconut milk, as it was a bit thick but needed more flavour. Add the cubed sweet potato back to the pot. This entry was posted in food and tagged lentils, living in Accra, slow cooker, soup, sweet potato, vegan on October 29, 2016 by krumkaker. 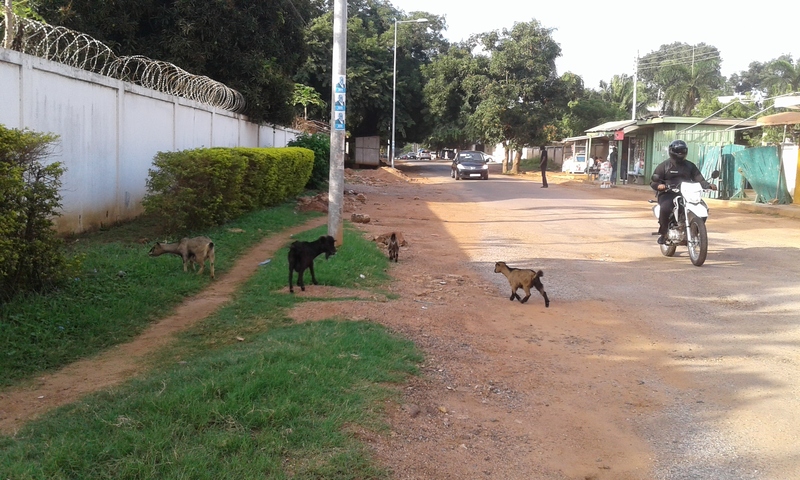 We live in a quiet area of Accra, and Sundays are even quieter. There are several churches nearby, and three mosques, so we hear snippets of singing and prayer calls over the treetops. Right now, from down the road I can hear a distressed kid (young goat) that has been separated from its mother — there is a particular pitch to that — probably one of the local goats that wander around. Small goats, but fat and happy — ah, quiet now, hopefully nothing serious, so now it’s the mosque we hear again. The road was paved since I took this (“See! It is election time!” said my driver) . 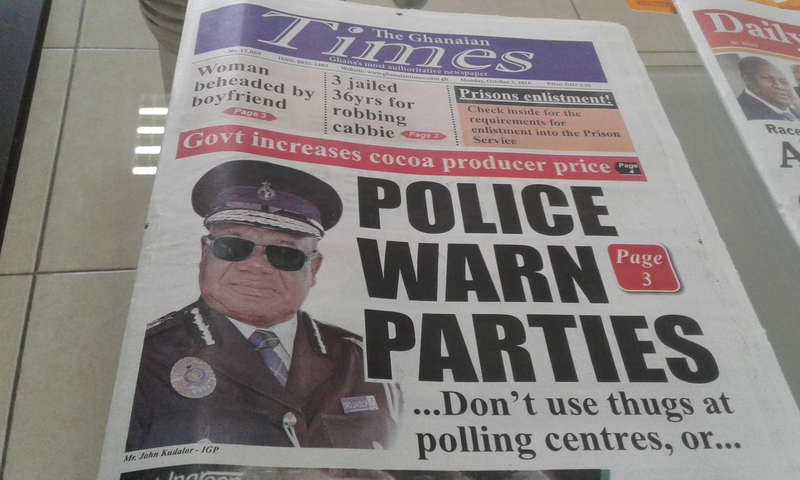 Ghana has elections coming up in early December. It’s quite different from the US elections run-up, though not reported much outside the country. 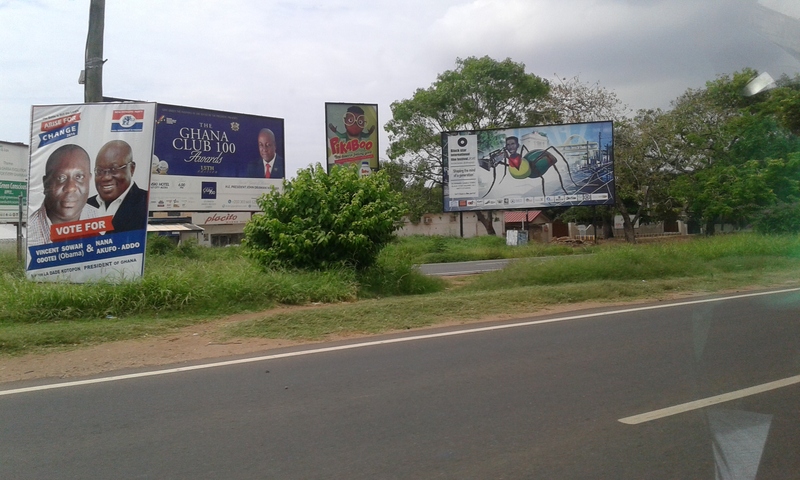 Ghana is a democratic republic, with several political parties. Mind of Malaka had a great piece last month on the elections and the Electoral Commission chair, worth reading. That aside, there are lots of election posters and party colours around town, and quite a few election-related parades with music, drums, and banners. A general theme is the call for peaceful elections, which will hopefully be the case. There have also been far fewer dumsor episodes (power cuts) which is also said to be related to the election countdown. It could also be due to the rainy season still not being over, which helps the hydroelectric power supply. The longer hot dry season is approaching, though, so we will see. On an apolitical note: looks what the supermarket had yesterday! You never quite know what will be in stock, I keep looking for deck chairs but no luck yet. 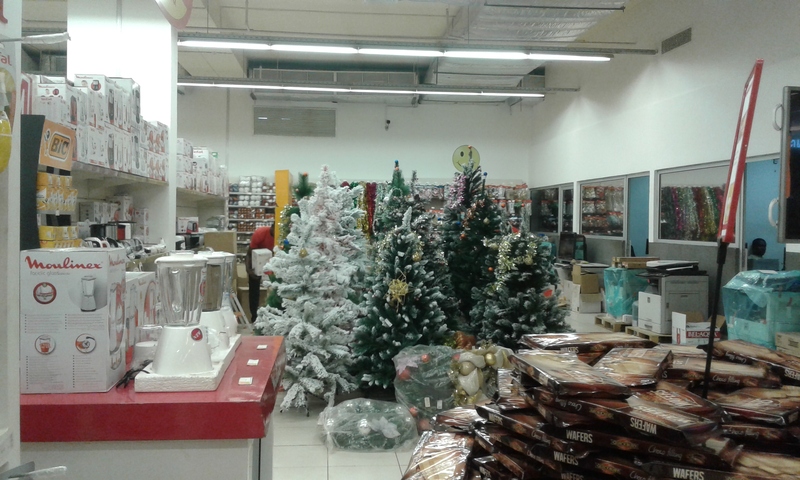 Here they are: artificial Christmas trees, frosted with snow! It’s never colder than 24C in Accra, often 100% humidity. It’s probably 32C today here in the shade on the balcony, getting hotter, so this did make me think of the pervasiveness of the concept of Christmas celebrations. Or maybe this is just what was on offer with a good price from China. We will be in Scandinavia for Christmas this year, and will have plenty of actual snow. No good pineapple or papaya like here, though! PS Yes, I am still cooking! Today: sweet potato soup with ginger and lentils, simmering in the slow cooker. Thank heavens for the slow cooker in this heat. The yoghurt maker has been on since seven AM, and I made granola last night. It’s just been busy here. Good to catch up and start writing again, though. This entry was posted in Ghana, travel and tagged living in Accra on October 23, 2016 by krumkaker.